The BBC is independent from government, with no political involvement in editorial policy, and it is funded by the licence fee rather than directly by government. Russia Today (RT), on the other hand, is registered as an agent of the Russian state, its coverage rigidly follows Putin’s agenda and it is funded directly by the Kremlin. 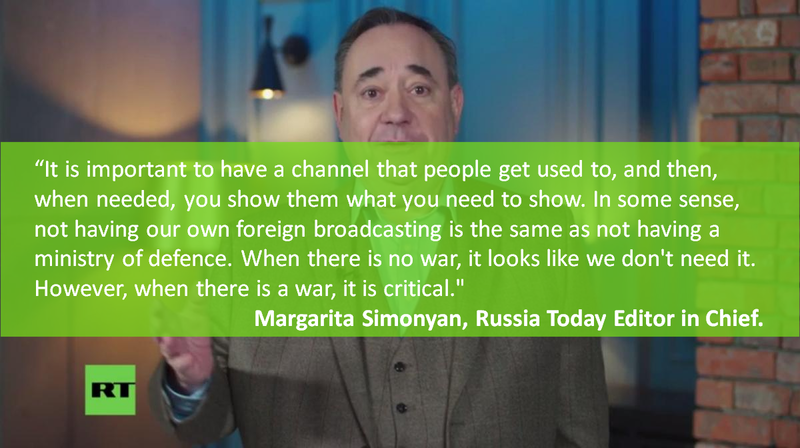 Knowing this, Alex Salmond criticised the BBC saying “there is a difference between being a public service broadcaster and a state broadcaster, and I don’t think the people at the top of the BBC understand the difference” and then he went to work for Russia’s state broadcaster, Russia Today. 370 million people worldwide go to the BBC for their news, it broadcasts in 31 languages, and for so many people in oppressive states it is often their only trustworthy source of news. Putin’s regime harasses, imprisons and assassinates journalists who try to tell the truth. Knowing this, Alex Salmond compared the BBC to “Pravda, the propaganda news agency in the old Soviet Union” and then he went to work for the Kremlin’s TV station. The BBC is recognised the world over for the quality of its output. It won 19 of 25 BAFT TV awards and produces landmark programming like Planet Earth 2 which was watched by half of the UK population. Putin’s TV channel gives airtime to anti-Semitic conspiracy theories, holocaust deniers and white supremacists. Knowing this, Alex Salmond labelled the BBC “a disgrace”, said that those who work for it should be “embarrassed and ashamed” and then he went to work for Putin’s TV channel. 57% of people say the BBC is the source they’d go to for trusted news (47 points higher than the nearest rival). The propaganda broadcast by RT on behalf of the Kremlin is so one-sided that its presenters have resigned in protest, even quitting live on air. Knowing this, Alex Salmond attacked the BBC as untrustworthy and “immersed in state power” and then went to work as a broadcaster for the Russian state. Never interrupt your opponents when they are making a mistake, so they say. Certainly jumping into bed with Putin, just as the biggest story in Western politics is concern over Russian interference in our democracies, counts as a pretty big mistake. 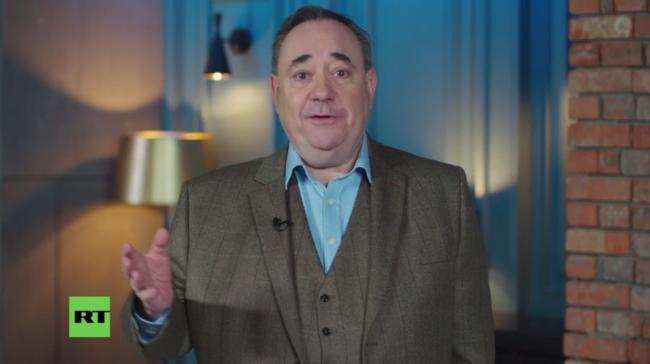 At least Trump’s associates had the good sense to hide the money coming from Putin’s networks, Alex Salmond did a promotional video proudly announcing he was now in the employ of the Russian propaganda machine. So I won’t interrupt, except to note that Twitter has been awash with SNP members suggesting there is no difference between Russian state media and the UK’s public service broadcaster. This isn’t just lonely people with 5 different twibbons on their profiles, it is an idea shared by parliamentarians. The SNP’s line is that Alex Salmond is now nothing to do with the SNP, but the last 24 hours has showed that a large portion of their party still follows him. However much Nicola Sturgeon’s leadership might wish it not to be true, thanks to the other leader, the nationalist cause now has a direct link to Putin’s media war against the stability of the West. By the way, I tweeted it last night and I’ll say it again here: those Labour MPs who still go on RT (as guests rather than as paid presenters obviously) should stop lending credibility to this station.